Reference: John Braithwaite and Peter Drahos, Global Business Regulation, Cambridge, Cambridge University Press, 2000, p. 177; Tony Clarke, ‘By What Authority! Unmasking and Challenging the Global Corporations' Assault on Democracy through the World Trade Organization’, Polaris Institute and International Forum on Globalization c. 1999, pp. 4-5. The World Trade Organization has greater powers than any other international institution including powers to punish non-complying nations that are not even available to the United Nations. Over 130 nations are now members of the WTO. It has become a form of global government in its own right with judicial, legislative and executive powers. Reference: Debi Barker and Jerry Mander, ‘Invisible Government. The World Trade Organization: Global Government for the New Millennium’, Sausalito, CA, International Forum on Globalization (IFG), October 1999 , p. 1.
the WTO has come to r ival the International Monetary Fund as the most powerful, secretive, and anti-democratic international body on earth. It is rapidly assuming the mantle of a bona fide global government for the ‘free trade era,’ and it actively seeks to broaden its powers and reach. Reference: Debi Barker and Jerry Mander, ‘Invisible Government. The World Trade Organization: Global Government for the New Millennium’, Sausalito, CA, International Forum on Globalization (IFG), October 1999 , p. 2. The WTO is able to enforce its rules through its dispute settlement mechanism. If a country complains that another is not abiding by WTO rules, the case is heard by panels of unelected lawyers and officials ‘with no education or training in social or environmental issues’, behind closed doors with no public scrutiny. These panels are able to find countries guilty of breaking the rules and to impose economic sanctions as punishment. Source: 'The Truth Behind the WTO', War on Want, 7 July 2006. Reference: Debi Barker and Jerry Mander, ‘Invisible Government. The World Trade Organization: Global Government for the New Millennium’, Sausalito, CA, International Forum on Globalization (IFG), October 1999 , p. 6. WTO rulings can declare legislation put in place by democratically elected governments as illegal. The WTO has fairly extensive powers to discipline nation states—as well as local, state and regional governments—for regulations and controls that are claimed to interfere with trade. WTO rules also take precedence over other international agreements including labour and environmental agreements such as the Convention on Biodiversity and the Montreal Protocol on Substances that Deplete the Ozone Layer. Reference: ‘Corporate Globalization Fact Sheet’, CorpWatch, 22 March, 2001. WTO rulings consistently favour free trade over environmental or social considerations. CorpWatch noted that between 1995 and 2001 “the WTO has ruled that every environmental policy it has reviewed is an illegal trade barrier that must be eliminated or changed.” The same was true of health and safety laws with only one exception. Reference: Public Citizen, 'Presidential Candidates’ Key Proposals on Health Care and Climate Will Require WTO Modifications', February 2008. 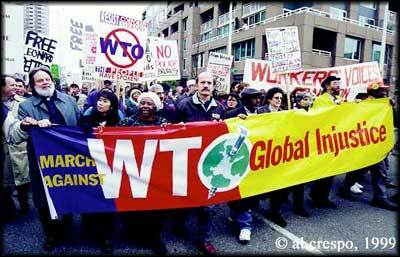 A more recent study by Public Citizen found that almost 90 percent of the 137 WTO challenges to national laws between 1995 and 2008 were successful, forcing nations to alter their laws to fit with WTO rules. The Public Citizen report showed that many of the proposed health and environmental policies being proposed by US presidential candidates would require modification to WTO rules before they could be passed. For example, Barak Obama’s proposal to require large employers to contribute to the health insurance of their employees could be interpreted as favouring small employers that would mainly be locally owned and this would be discriminatory against larger foreign companies. The report concluded that “unless a government could foresee that it would need to take future action on an unimaginably broad swath of policy areas when it made its initial WTO commitments in 1994, it now faces unacceptable WTO constraints on new non-trade policies deemed necessary”, including social policies. A range of powerful corporate lobbying groups and coalitions were crucial in advancing the General Agreement on Tariffs and Trade (GATT) which led to the establishment of the WTO. Within each of the major nations that dominated the GATT negotiations, business leaders had privileged access to influence their country’s negotiating position. The economic or trade ministry officials involved in the negotiations were lobbied extensively by industry at both a national level and an international level by groups such as the International Chamber of Commerce (ICC) and the OECD's Business and Industry Advisory Council (BIAC). 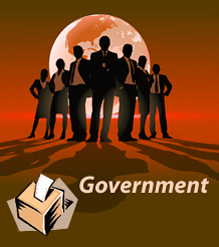 No other non-government groups had the access or influence accorded to business groups. In this way, the negotiating positions of the dominant nations reflected business interests rather than a broad spectrum of democratic interests.